Dan Slott, the Marvel writer who regularly whines about people taking him out of context, has no qualms taking others out of context when his personal politics are at play. 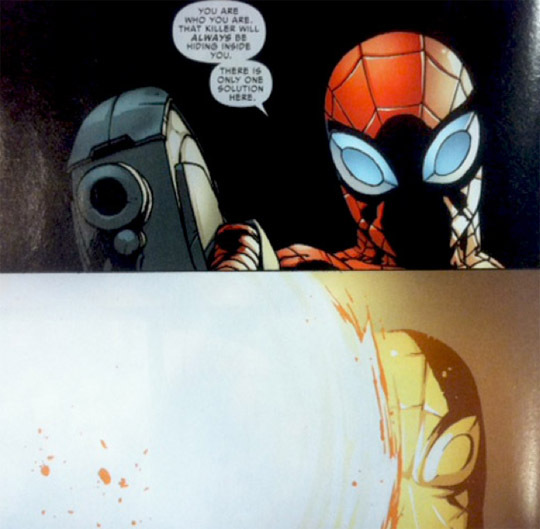 The same guy who had his “Superior” Spider-Man blow a guy’s face off with a handgun from point-blank range had no problem chopping up a lengthy conversation by Jeb Bush on the Umpqua Community College shootings into Tweets devoid of any context. “Jesus. 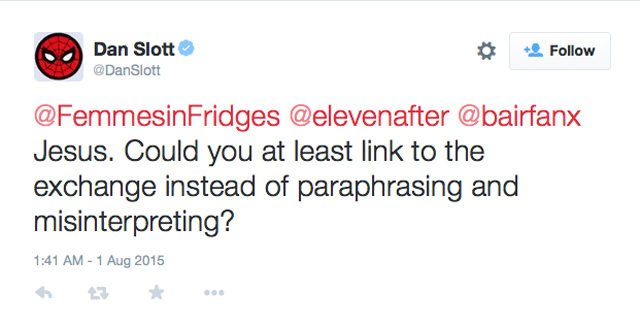 Could you at least link to the exchange instead of paraphrasing and misinterpreting?” – Dan Slott. Unlike Dan Slott, Jeb Bush had to deal with the aftermath of hurricanes, budgets that affected millions of people, etc. Jeb Bush actually had to make gut-wrenching decisions as the governor of Florida. He understands that with a stroke of the pen, politicians can turn the lives of entire communities upside down. When Dan Slott doesn’t go to a comic convention or misses a deadline, civil rights are not eroded. Mr. Bush was trying to have a serious public policy debate when he made those comments. He acknowledged that what happened in Roseburg, Oregon, was a “heartbreaking” tragedy, and then talked about the broader public policy question at hand. Unfortunately, Mr. Slott couldn’t resist acting like a political vulture to exploit the situation. For those who want a better idea of what Dan Slott does, I will now provide a clear example. Last Thursday, 26-year-old Christopher Harper-Mercer specifically targeted Christians in a massacre that killed nine and injured seven. He took his own life during an exchange of gunfire with cops. Imagine if I shared that information and then juxtaposed it with Dan Slott’s infamous “Christ-Land” tweet – without any context. Do you think Mr. Slott would be upset? I do. 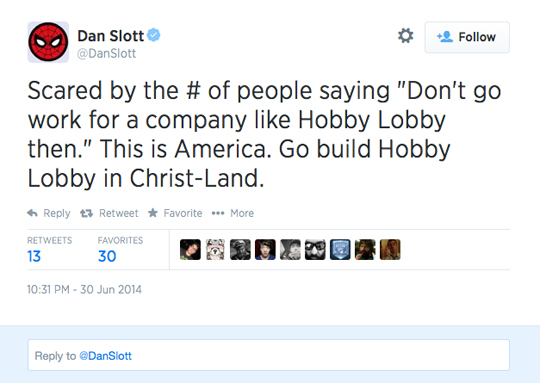 Here is the full context to Mr. Slott’s “Christ-Land” tweet, for those who are interested. Ask yourself this question before reading it: If there was another Boston Marathon-type bombing and a politician Dan Slott didn’t like said, “Scared by the number of Muslims who are silent on domestic terrorism. This is America. Go to Muslim-Land,” do you think he would call that person a bigot? I do. Slott really needs to look in the mirror. He whines about people “taking him out of context” and then has the gall to selectively quote Jeb Bush? What a hypocrite. I’m no fan of Jeb Bush, either (I don’t want anymore political dynasties in the White House, Bushes, Clintons, etc), but I understand what he was saying. 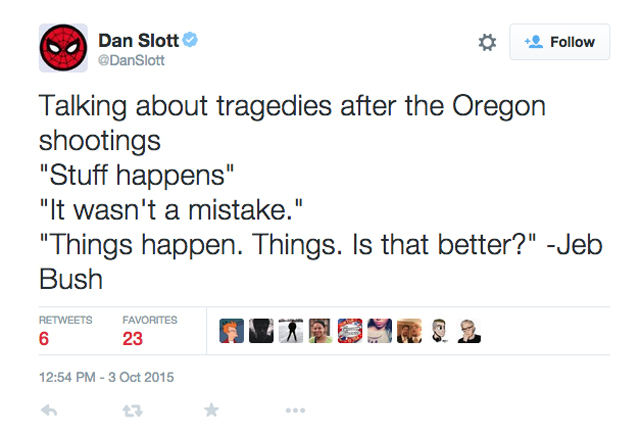 Dan Slott’s tweet makes it seem like a reporter walked up to Bush and said, “What’s you’re reaction to the Oregon shooting?” and his reply was “Stuff happens,” with a shrug of his shoulders. Should we ban cars? It is much more likely that Americans will die or severely injure themselves in car wrecks, but it would be silly to call for a ban on automative vehicles. It would certain save lives if we made it against the law for anyone who has a drop of alcohol to operate a vehicle, but it would also make no sense. Bush’s underlying point – which he made after stressing the sadness of the Oregon shooting – is that public policy makers are asked to act in the face of tragedy all the time. What they are asked to do, however, sometimes is irrational and dangerous to the long-term health of civil society. Dan Slott should really stick to just writing comic books, because almost every time he ventures into politics he embarrasses himself. Not surprisingly, the MSM have also been pushing the “Bush just shrugged and said, ‘Stuff happens'” meme. Meanwhile, of course, Barry and Hillary have exploiting the tragedy, calling for the usual “reasonable common sense gun control,” blah blah blah blah. We have much stricter gun control in the UK. A number if years ago my dad applied for a shotgun licence to shoot pigeons on farmers land as pest control. My dad’s a little hard of hearing and ought he had been asked if he was married. While I approve of gun control there needs to a common sense approach and an actual discussion rather than an “oh my god! All gun owners are maniacs” reaction every time an event like this happens. After all, if someone really wants a gun they will get one through illegal channels. It’s ironic that Bush was speaking about the deeper impacts of politics and how weighty these decisions are; how so many people can be hurt by the wrong choices of a politician, and here’s Dan Slott, like so many other young or otherwise emotionally stunted Americans, treating politics like a sport, like they’re drunken hooligans in the stands trying to distract the player with their heckling as the make a free-throw or swing at a pitch. The likes of Slott and the average internet age liberal don’t care about the issues or the people affected. They only care about checking the scoreboard on Gawker and seeing if they’re still winning. Sabezan, thank you so much for your comment. To stick with the sports analogy, that was a home run. Again, thanks for reading and adding to the discussion. I really appreciate it. Dan Slott’s comic books are more grounded in reality than his political foundations. I noticed that out of Dan’s 79,000+ followers, that comment only got six retweets. Even his own fans seemed to know that taking cheap shots for political points after a tragedy isn’t cool.